To us here at Earth Mantra, Tone Ghost Ether never fails to amaze. Not only is this a group of singularly talented artists; not only do they track all their music live; not only is the music all improvisational; not only do they revel in combining completely unrelated musical instruments; but they drift effortlessly from style to style, as if there is no such thing as a boundary between musical genres. Of course, in reality there really is no such thing as a true boundary, but nevertheless the demonstrated ability of these three artists to cover so much musical ground without even breaking a sweat is nothing short of inspiring. A textbook case in point is their latest release on Earth Mantra, entitled Hydrogen 2 Oxygen. But whereas the artists themselves describe the musicas a form of 'acid jazz', we are less sure how to label this music. Sure there are elements of chic jazzy beats, but there are so many influences, ranging from world fusion to electronica, and yes, to ambient music itself, that we feel this can only be described as a wholly new fusion of styles. Ambient Electro-World Nouvo-Jazz? Well, regardless of what label one wants to attach to this music, there is another tag that we feel certainly matches it: SUPER FREAKING COOL MUSIC. 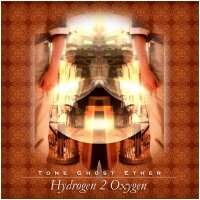 As with all Tone Ghost Ether releases, the musicianship on this release is utterly impeccable, the creativity is off the charts, and the uncanny ability of the artists to improvisationally blend their music in real time in such a transparent and synergistic manner continues to, for lack of a better term, blow our minds. In fact, the only negative thing we can possibly say about this album is that it is likely to be the last Tone Ghost Ether release on Earth Mantra for the foreseeable future, since we now carry every single TGE album ever released. We certainly hope that someday lightning strikes twice and this amazing group of artists meets again to create their own special brand of sonic majesty. Until that day, at least we have wonderful releases like Hydrogen 2 Oxygen to comfort us. Hard to describe but a must! This is a brilliant creation of world-music & jazz-fusion interspersed by electronic ambience and experimentation. Sometimes the music is rhythmic, othertimes it is laid-back and ambiental. I guess I could describe it as in the style of David Sylvian's 'Gone to Earth'-album (minus the vocals). It is a music style that is hard to describe but very enjoybale to listen to.